Welcome to the Day 2 Liveblog for the World Tour Finals! Today we have Roger Federer’s debut against Janko Tipsarevic. 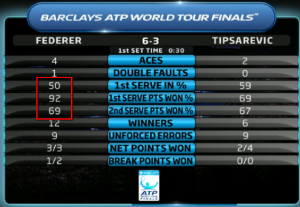 Federer is undefeated against Tipsarevic in five tries. Later we will have Juan Martín del Potro square off against white-hot David Ferrer, who is playing his third straight week of tennis. Ferrer leads their head-to-head 5-2. The last time DelPo beat him was back in 2009. Remember to refresh this page often! 7:57 am – Jonathan Marray and his Danish partner have just beaten Bupathi and Bopanna, so we should be underway soon with the first singles match of the day. ESPN3’s feed is showing the end of Djokovic-Tsonga from yesterday. Why do they like to torture us? Once was enough! 7:59 am – Disclaimer: I spent all night writing this. No sleep. This might get interesting. 8:03 am – Robbie Koenig informs us that if Federer wins one more match, he’ll pass Lendl for the most WTF wins record. Adrian Steiner is our chair umpire. Janko Tipsarevic wins the toss…and elects to receive. I will never understand this. In related news, Federer holds easily. 1-0. 8:17 – Federer draws an error from Tipsarevic’s forehand, then brings the Serb to the net with a short slice, and drills a cross-court backhand pass for the break. 2-0. The only suspense in this match is whether Janko will finish it. Really. Federer holds, and he’s up 3-0. The match feels over already. 8:27 – Both men hold easily. It’s 4-1. Nothing to see here. Funny that @pseudofed tweeted about Tinky Winky earlier. Dressed a bit like him now. 8:41 – Federer wraps up set no. 1. He was sharp to start it, Tipsarevic wasn’t, got the break, cruised from there. 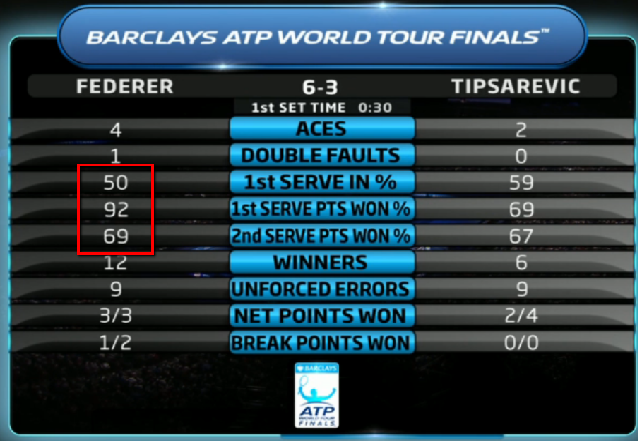 Note to Tipsarevic: if Federer serves at 50% 1st serves in a set…you gotta make him pay for it. Further to Federer’s kit choice: black shorts, socks and shoes always looks terrible on Fed. The shirt design is a 30 second throw off. In quasi-related news, Tipsarevic holds. Better hitting by Biljana’s husband. 8:58 – Tipsarevic survives two break points but not the third. 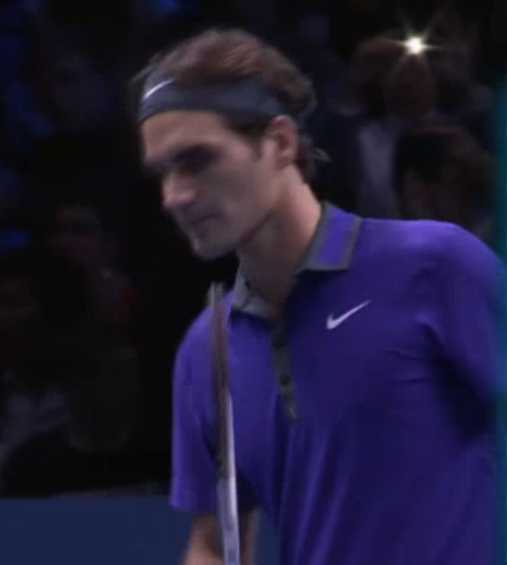 Federer up a set and a break, and you might as well hit Reset in the console, because it’s Game Over. 9:01 – Federer consolidates the break in 1 minute and 16 seconds and is up 3-1. Do I smell sudden fatigue? I don’t understand Tipsarevic. Federer runs around his backhand, hits a forehand. Instead of trying an angled cross-court backhand, or a backhand down the line, Tisparevic hits a 3/4 speed backhand right at Federer. You can guess what happens to him after that. 9:06 – The point of the match (so far) sets up break point for Federer. It was a lovely exchange of angled drop shots. On break point, Federer shamelessly move to his backhand side looking for a big forehand return… and Tipsarevic aces him with a second serve. Federer sets up two more break points – Tipsarevic saves the first with another service winner, then cracks in the next one. Becomes obsessed with attacking Federer’s backhand with about 54483848 crosscourt shots, wasting the same number of chances to go down the line with his forehand or backhand. Federer makes him pay. Federer up 4-1, double break. Go on, Tipsy.It’s about 5 points to go.Retire. Federer holds without much fuss. Jason Goodall says that was Federer’s 53rd straight service hold vs Tipsarevic, and that during that entire time, he’s only faced two break points. That should make you a first-ballot Return of Serve Hall of Shamer, Janko Tipsarevic. 53rd consecutive hold from Fed vs Tipsarevic since third round Aussie Open 2008. In all that time, Fed’s only faced 2 Break points!!! 9:19 – Federer wraps up the match without much incident, 6-3, 6-1. He breaks Lendl’s total WTF match wins. Barely had to break a sweat. 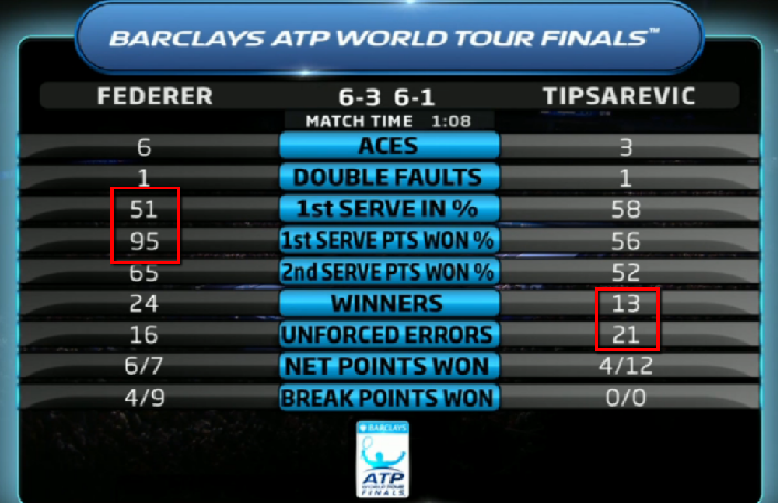 Federer was impeccable in execution of his shots, and the only concern might be the 1st serve percentage. Well, that was a thoroughly uneventful match. Let’s hope DelPo-Ferrer is more competitive. The Liveblog will be back then! Some doors are supposed to stay shut. I have no idea what she’s talking about, but let’s hope it’s some sort of good omen for this afternoon’s tennis. 1:59 – The only word you need to describe both shirts on display at the O2 Arena this afternoon: fluorescent. Aggressively fluorescent. Ferrer’s orange shirt with its bizarre blue highlights on the collar and sleeves has to be one of the ugliest of the year. I refuse to do a screen cap of it. Del Potro wins the toss…and elects to receive. Again. I DON’T UNDERSTAND THIS LINE OF THINKING. 2:02 – Interesting to note that while Nike has 3 players on display at the World Tour Finals (Federer, Del Potro and Berdych), they only made one special kit for this tournament (Federer’s naturally). No wonder Del Potro is bolting them for…. *drumroll please*….Li-Ning. 2:05 – Interesting that even when we think Del Potro is “back” and that he had a great year…he only made two finals all season (Rotterdam and Basel). @juanjo_sports enjoying your live blog, but what am I misreading in the delpo two finals bit? He has 4 titles-basel,Vienna,estoril, Mars?? 2:10 – Del Potro starts the match by challenging a ball that was easily long. Ferrer holds to 15. 2:14 – Del Potro holds to 15, in a game that was highlighted by a fantastic cross-court backhand passing shot. 2:20 – The tall Argentine misses a 2nd serve return on his first break point of the game. Will he regret it later? Ferrer sets up game point with a great backhand down the line (a shot he rarely – if ever – hits), and closes the game with a fantastic reflex volley. Ferrer’s strategy in this match is fairly simple and coherent: make Del Potro hit almost every single shot on the run. The Spaniard, not known for being a bad tactician, is hitting almost exclusively to the open court. 2:23 – Imminent retireee Lars Graf reassures DelPo that his ball was long…but Hawk-eye shows us it was barely in. The Argie did not challenge the call. Ferrer then plays a masterclass of a point in terms of hitting to the open court, and finishes with an inside-in forehand winner to set up double break point. Then the Spaniard comes up with a fantastic down the line forehand pass that Del Potro volleys wide. There’s no slowing the recent Valencia and Paris Masters winners, apparently. However, Del Potro is in the middle of one of his classic tentative starts, and he’s getting bossed around the baseline by Ferrer. He needs to start unloading on his groundies. And soon. Wow. Lars tells Delpo was an inch out. Ball was just barely in. Yikes. Don’t see that too often. 2:31 – Lars Graf does it again! He tells Del Potro that his serve was long by an inch, but this time the Argie challenges the call. The ball caught the line. Related: that serve was at 15-30. Kind of important. 2:33 – Ferrer manufactures another break point, which Del Potro saves with some good shots full of controlled aggression. He then nets a regulation backhand, and it’s break point again. Then, the point of the match so far: Del Potro FINALLY starts grunting and unloading, and doing so into the open court, pushing Ferrer back and getting shorter and shorter balls. Wins the point on a down the line slice winner, after Ferrer hit an incredible forehand stab pass. DelPo sets up game point with a pretty great backhand smash. Ferrer sends a return long, and Del Potro holds. Here’s the stat that worries me: Delpo winning only 44% of points behind his first serve. Ferrer such a good returner. 2:40 – Ferrer with an uneventful hold, goes up 5-2. 2:46 – Del Potro held without much fuss, and two unforced errors on his part give Ferrer a quick 30-0 lead when trying to serve out the set. Then come two very good forehands, pulling Del Potro wide, and it’s triple set point. Del Potro saves the first one with a blistering down-the-line forehand, after Ferrer had him running around. Del Potro then crushes a return back, Ferrer blocks it down the line, comes in behind it, the Argie gets a great lob over the Argie. Ferrer naturally chases down the lob, hits a desperate forehand, and Del Potro sends the easiest shot of the game tamely into the net. Set for Ferrer. 2:50 – Ferrer had 8 winners and 8 unforced errors in that set. Del Potro had only 9 winners but 16 unforced errors. I don’t mind the UFE count for him – he does need to step it up a notch in terms of aggression. Whatever it is he’s doing at the moment almost had him down a double break, and he’s failed to generate a single break point in Ferrer’s service games. Fascinating. And you can compare it with the one I captured during the Paris Masters. 3:00 At 40-30, DelPo had Ferrer firmly stuck in his BH corner, and he was pummeling inside-out forehands. However, instead of finishing the point by going down the line with either his forehand or his backhand, DelPo hits a dropper. 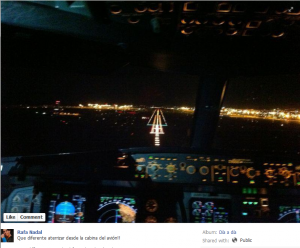 Which Ferrer tracks down. And hits past him for a winner. 1-all. That pathological fear of going down the line once again starts being problematic for DelPo. 3:03 – Classic ATP dysfunction! If Larry Ellison gave ATP players an extra $$, it would reflect badly on other tournaments. So they vote down a $800k gift. Really? 3:06 – DEL POTRO GETS SCREWED BY A LINE CALL FOR THE THIRD TIME. He doesn’t challenge the call (ball was in), and it’s break point. Saves it with a service winner up the T.
Ferrer is being so good at dictating with his forehand. Getting awesome depth and placement, even without a whole lot of power. So smart. Two more break points come and go for Ferrer, and Del Potro sets up a third one by double-faulting. BUT SAVES IT WITH A BACKHAND DOWN THE LINE! WINS THE POINT! Sorry for the #sarcasmfont there. Ferrer nets a regulation cross-court backhand, and DelPo finally has a game point instead of a break point against him. Ferrer helps his cause with a forehand that sails long, and a possibly key game ends with DelPo holding. 3:12 – The ATP physio is looking at Del Potro’s hands. Apparently, they’re getting cracked from dryness. Really? So random. Just looks to be a blister or cracking hands for Delpo, thank god. Not the wrist. What’s up with Delpo? Got o sound in here. Thumb? Hand? Wrist? WRIST? WRIST? A trainer visit to DelPo in which they look at his hands is never a comfortable sight for those who have followed his career. 3:17 – A Ferrer backhand down the line winner sets up game point for him. So weird to see two of the most reluctant users of that shot hit some good ones in this match. Del Potro wrong-foots Ferrer with a soft swinging volley, and it’s deuce. Ferrer with a couple of errors, and Del Potro has his first break point. Of the match. In the fourth game of the second set. Bear in mind, Del Potro is not playing Karlovic here. Surprisingly, Ferrer sends another forehand unforced error long, and the tall Argie has found himself a break of serve. Up 3-1. 3: 22 – Del Potro is up 40-0 in what seems like a nanosecond. Consolidates the break just a moment later. Signs of mental burnout for Ferrer? The Spaniard has played an awful lot of tennis in the last two weeks. 3:28 – Ferrer had a love hold, and is now it’s 30-15 for Del Potro on his serve. 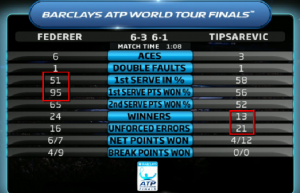 Also, Ferrer already has two more UFEs than he did in the entire first set. Del Potro/Brody has one of the worst challenges of the week at 40-15. No matter, seals the game with an ace. 3:35 – Ferrer starts DelPo’s potential set-clinching game by hitting a BH DTL winner. I’m so confused. 3:37 – Down 15-30, DelPo comes up with a huge service winner up the T. Then goes wide (a good call against a “narrow” returner like Ferrer), and it’s set point. He botches it by sending a 2nd ball forehand into the net. Deuce. A bad double fault, and it’s break point. However, Del Potro comes up clutch again, with a sensible bomb up the T. Those will always be difficult for Ferrer to get to. Then the pair trade a lot of forehands, and the guy with the bigger one ends up with the point. 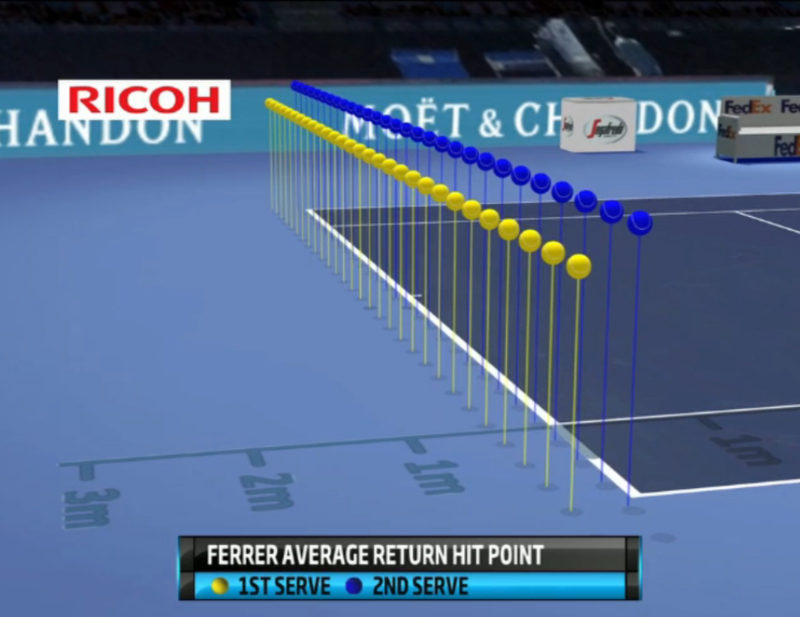 Ferrer was trying to be aggressive there, but he was getting no pop on his shots. DelPotro finally punished one of many short balls he had. And then set point is a beauty: they trade forehands again, and once DelPo has the advantage, pummeling inside-out forehands to Ferrer’s backhand, he goes inside-in for once, draws the short ball, and finishes with a beautiful dropper. Was that a tribute to Mr. Janowicz? Onto a decider! 3:46 – Incredible forehand passing shot by Ferrer, hit when falling backwards. That was fantastic, and key: missing it would have put him in a 15-30 hold. A couple of good forehands later, and Ferrer holds to start the third set. 3:50 – Ferrer with an incredible forehand DTL return to go up 0-40 on Del Potro’s serve. Incredible shot. Del Potro saves one with the wide-serve-forehand combo, Ferrer sends a very makeable BH return into the net, and we’re at 30-40. Ferrer gets an angled cross-court backhand return in (with a little bit of frame on it), Del Potro approaches Ferrer’s forehand corner, and Ferrer nails him with a cross-court FH pass. Break for the Javea man. Related: Ferrer consolidates the break with some sparkling play. He’s regained the focus he lost midway through the second set. Now firmly in control of the match. Meanwhile, Del Potro has retreated into his 3rd-gear shell. 4:12 – Liveblog technical difficulties get solved by Amy just in time for Del Potro to get the break back, FINALLY unleashing the full power of his game. It’s taken a while for the notorious slow starter, but I guess it’s better late than never? 2-4 in the third is pretty close to “never”, really. Jason Goodall mentions how we’ve “been waiting for a response from Del Potro and FINALLY” we got one. Not the only one using the all caps FINALLY. This has been a very interesting match. It occurs to me that Juan Martín del Brody is having the same problem Tomas Berdych had a few years ago: more often than not he’s trying to play little man tennis, when he’s got big man weapons. Like Janowicz said, when you’re so tall, you can’t really get into long rallies from the baseline. People move better than you. Just lock, load and FIRE. Related: Del Potro has a straightforward hold to consolidate the break. HUGE game coming up on Ferrer’s serve. 4:19 – Ferrer responds to the pressure by serving out a love hold. All that enormous pressure will now be firmly on Juan Martín del Brody’s shoulders. The Argie can’t be tentative, because Ferrer will pounce. It’s big-time tennis or bust from now on. 4:33 – Ferrer bosses Del Potro around, and finishes the first point with an inside-out FH winner. Then goes for it on an inside-in forehand that draws a very short ball by DelPo, which Ferrer smashes away. 0-30, two points from the match. More aggressive dictating by Ferrer with his forehand, and it’s triple match point. What a game by Ferrer so far. Absolutely clutch. The Spaniard gets a great return in play, and Del Potro sends the forehand long. What a return game by one of the game’s elite returners. And his winning streak keeps going! 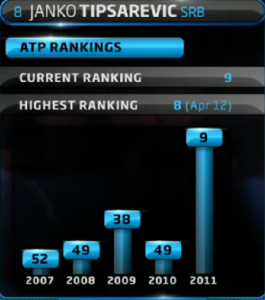 Also, Ferrer inches closer and closer to Nadal in the rankings. Needs to arrive to the final with at least three wins to surpass his buddy, which is quite possible, given Tipsarevic’s level and the fact that nobody in the other group has been brilliant yet. As for DelPo, he just wasn’t aggressive enough throughout the match. Too much little man tennis, and he wasn’t going to beat Ferrer at that. If anything, had Ferrer gotten the early break in the 2nd set, when he had multiple chances, this match would’ve been over much earlier. Still, kudos to the Argie for fighting back at 2-4 in the third, but it was too little, too late. And that wraps up today’s Liveblog. Be sure to tune in tomorrow for another installment! PS: Now that’s a proper tweet, Rafa Nadal! Buen partido de @davidferrer87 !!! #VamosFerru! !